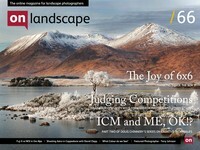 We at On Landscape have been aware of Terry and his growing body of work for some time. His approach to photographing trees is strongly graphic and quite reminiscent of some oriental art. His refreshingly different approach to a common subject is inspiring. I left school at fifteen years old with a somewhat negative outlook on education in general. I worked consistently undertaking various jobs and met my partner, Liane, whom I have been in a relationship with for more than thirteen years. At the age of eighteen Liane and I embarked on our first independent to Sri Lanka and, not wanting to sound too clichéd, but, the sights sounds and experiences that we encountered in those short three weeks were life changing. Armed with an APS camera, photography got a grip of my soul and would not let go. The next six or seven years followed a similar pattern; we would work hard, save every penny we could, book our flights and travel (predominately to South East Asia) where armed with me first 35mm camera, photography engulfed my life. On our return, I started some basic photography evening classes in my home town of Warrington. I later went on to a two year BTEC National Diploma in Photography and Wigan and Leigh College. These two years at college were a milestone in my life. Having always been relatively academic in school, but not having any qualifications to prove this, I had to not only complete the photography course, but also complete my Maths and English GCSE equivalent (which I’m thoroughly glad that I did). The photography aspect of my college experience helped be to comprehend the basic concepts and principles of photography. Using 35mm, medium and large format cameras, printing and developing both colour and black and white film whilst experimenting with digital technologies gave me great fundamentals in the art of photography. I applied for three universities and luckily got an interview at all three of them. My first was the BA (hons) Wildlife and Environmental Degree course at Blackpool and the Fylde College (an associate of Lancaster University). There I was interviewed by Jonathan Rowe, the course leader, and the course ticked all the boxes for me and I was offered a conditional place there and then and I did not hesitate and accepted. I no longer have a negative outlook when regarding education. Last year I won 1st place in a North West arts competition and won a solo exhibition (which is running now until the end of October at the Pyramid centre in Warrington). I am also a judge for this year’s competition and it is an honour and a privilege to partake in such an important and prestigious role. In most photographers lives there are epiphany-like moments where things become clear or new directions are formed. What were your two main moments and how did they change your photography? The first was travel without a doubt my biggest and greatest (too many superlatives) ‘epiphany’ moment because, up until this point in my life, photography did not exist in my naïve world. It changed my life in so many ways and continues to do so (why else would I be answering these questions, if it were not for photography)? The second was my second year in university. We had a lecture by a female tutor (my apologies but her name escapes me). She was an expert in Japanese film and Photography and opened my eyes to a whole different world of influences. Starting with ‘Seven Samurai’ Akira Kurowsawa’s most critical and poignant movie, I found photographers such as Shomei Tomatsu and Daido Moriyama who’s cultural differences and diversity to that of my own created a new and exciting prospect for my future. Tell me about why you love landscape photography? A little background on what your first passions were, what you studied and what job you ended up doing? My first passion was (and probably still is) reading. The Chronicles of Narnia by C S Lewis, along with books by Roald Dahl and Tolkien (followed by Stephen King as I got older) created imaginary landscapes that were part of my own escapism. Maybe that’s where my admiration and enjoyment of landscape photography came from? Along with holidays and family trips, I have always loved the outdoors and how light can change and manipulate ones perspective, both visually and emotionally. I have been a window cleaner for some fifteen years. It is a job I do not particularly like but, having said that, it is my own business and has enabled me to travel and study. I use Nikon and either Nikon or Sigma lenses. My ‘work horse’ lens is my 17-70 mm but in my kit bag I have a 50mm, 105 mm macro, 70-300mm and 120-400mm. I see my cameras and lenses as a tool to make better decisions regarding my photography. I don’t get caught up the latest gadgetry and ‘next best thing’. I would love a Mamiya 7 though! I solely shoot digital these past 18 months as I have no access to a dark room anymore (which is frustrating and something I hope to change in the not-so distant future). When out shooting, I have a plan. I keep a journal and (within reason) try to pre-visualise my photography. I am currently working with the Warrington Arts Council (a gallery curator called Emma Kelly) on a project titled ‘within three miles’ that explores overlooked aspects of the natural world that people rarely notice or simply choose to ignore. After a day’s shooting, all my raw files are uploaded that day and I start working through and delete what does not work. Digital can (and used to) make me a little lazy I think (especially when compared to my film shooting days) yet now, I don’t take as many shots as I used to and have slowed my whole process down and I am seeing much better results. Seeing my work in print is what photography is all about (in my humble opinion). I print as much as I can afford from 6x4 inch to 20x16 inch for exhibitions. I also have a few books that I have created (both personally and for university projects) and am currently looking into creating a limited edition photographic zine. I send all my digital files to Pro Am Imaging in Bradford and in the past five years, I have been 100% satisfied. Alec Soth: Alec Soth seems to create an intensely rich visual narrative. Alec has a self- confessed ‘awkward naivety’ with his subjects that seems makes them relax in his company. He makes books that show journeys of discovery and to date, is one of my favourite (most inspirational) photographers. Tim Flach: Whilst at university, Tim Flach was a guest lecturer at my university and I was blown away from his project ‘Aquus’. Later came’ DOGS:GODS’ and most recently ‘More than human’. Tim explores themes and concepts that are heavily related to anthropomorphism. He takes animals from their natural surrounding and places them in a studio setting thus, totally changing ones visual outlook towards how we (as humans) view them. Tim Hetherington: Sadly, Tim died last year whilst working as a photojournalist in Misurata, Libya. Since my early college days, photojournalism had been a career path that I wanted to follow. I admire all photojournalists but, after watching a Tim Hetherington interview I was filled with emotion at his humble nature and outward respect for his subjects. Ron Jude - ‘Lick Creek Line’ tells the story of a lonely trapper in Alaska and his daily turmoil’s and adventures. Beautiful inspirational work by a master of his craft. Claire Richards - ‘Beyond the Forest’ shows rural Romania and its inhabitants with beautiful landscapes and portraits. A different approach on a often explored subject. Nadav Kander - 'Yangtze - The Long River' is a large format book that explores China in the 21st century. All images were taken along the majestic Yangtze. It’s depicts cultural change. There is not a day that goes by where I do not partake in some form of photographic aspect. Whether it be taking pictures, reading or researching or looking at other photographers work. Each and every element helps shape myself as a photographer. This body of work is titled Ki No Mori (which roughly translates to “the wood for the trees” in Japanese). The images created pay homage to Japanese film and Photography (both past and present) and use black and white photography (that often highlights movement and contrast) to create photographs that explore seasonality within nature. These images are inspired by the works of the acclaimed Japanese film director, Akira Kirosawa. Trees: "How often do we look at and admire a simple tree in its most simplistic form? The tree seems to invoke certain memories, feelings and emotions that are often enhanced with the changes of the seasons. The tree exudes energy, grace and stamina. From the movement of a branch in the wind, to the silhouette of a leaf enhanced by the setting sun: the ever changing tree is always a constant." From the series, this image is my favourite. My eye moves from left to right than stays on the dark and blurred tree trunk. There is a scene in the movie IT (the film is an adaptation from the book of the same title by Stephen King) where the characters are looking through a book when the images start to move and a clown comes into view, even though I have seen the movie many times, this scene always makes me feel very uncomfortable, but I quite like it... if that makes sense! The reason I write this seemingly unrelated tangent is because in this image (maybe due to the out of focus nature of the image) I always feel like someone is lurking just out of view and waiting to come into the scene. It also feels like a movie still! I am fortunate to have good friends and family around me and I share similar interests. I am a keen cook, I enjoy walking my dog regularly and going to the gym. I adore photography because it challenges me every day. I enjoy experimenting with different techniques and will be a student of photography for the rest of my able life. I am still fascinated by Japanese film and photography and my photography seems to be concentrating and elements of the natural world that usually go unnoticed and ignored. I want to bring wildlife and natural history in my locality to the forefront of people’s visual imagination and hope to inspire future photographers as I have been inspired. Bryan Schutmaat has recently produced some simplistically magical work that is titled: Greys the Mountain Sends. The body of work explores rural mining towns in western America. Through landscapes, still life and portraits Bryan creates a sense of realism that is often lacked in projects of this nature. He is inspired by the poetry of Richard Hugo and explains how these words help create a visual narrative that is ambiguous in nature, often asking as many questions as are answered. When my images make me think, for whatever reason, then I feel like I have something to say.